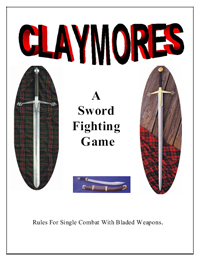 Rules for combat using bladed weapons. All known blades are listed or will match one listed. This is single figure combat. Most players can handle 4 figures at one time. Great for tournaments. Paul Morin 7 6 7 Overall a good system but there are lots of areas open to interpretation. Be prepared for lots of discussion while running a game. Lack of any sort of reaction rules seems like an omission in a game of this scale. Ronald Pehr 9 8 9 Very detailed, but if you're a hard-core wargamer you'll love it!